2. Parboil potatoes for 15 minutes. 3. Drain the potatoes and place in a mixing bowl. 4. Pour in the olive oil, stir well, add salt and rosemary and stir again. 5. Place potatoes on a rimmed baking sheet and roast for 45 minutes, turning several times to brown evenly. 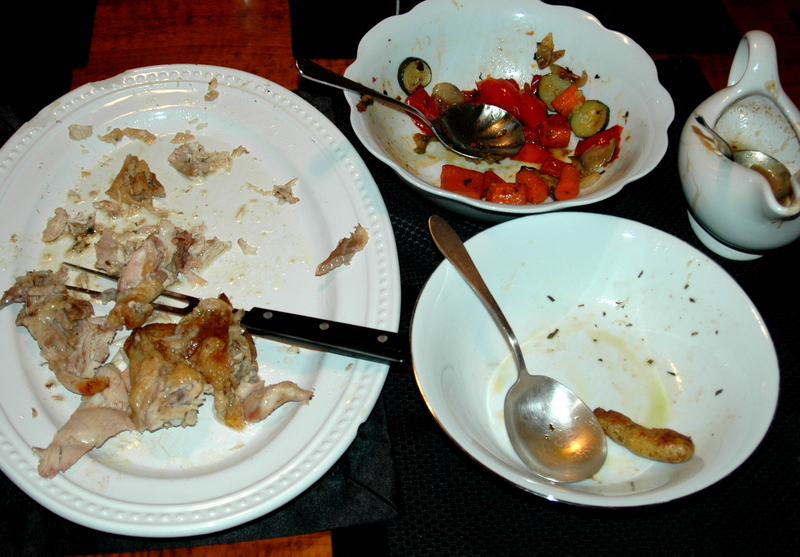 Sunday Chicken Dinner – No Leftovers! Last weekend, one of our daughters and her family came for a visit. As working parents with a toddler and an infant, she and her husband do not have a lot of time to prepare big meals. So when she expressed a desire for a Sunday chicken dinner, we willingly and lovingly headed off to the market to get the fixings: large roasting chicken, vegetables, potatoes and, of course, dessert. We settled on a seven pound Bell & Evans organic chicken and a colorful medley of fresh vegetables, which we decided to roast in keeping with the autumn season. Fingerling Potatoes, which are easy to prepare and have a great taste, were in stock so we chose them over Yukon Gold, which we frequently use, and Idaho and russet. Several herbs to enhance the chicken, vegetables and potatoes were obligatory, and for their healthful aspect, fresh berries for dessert. 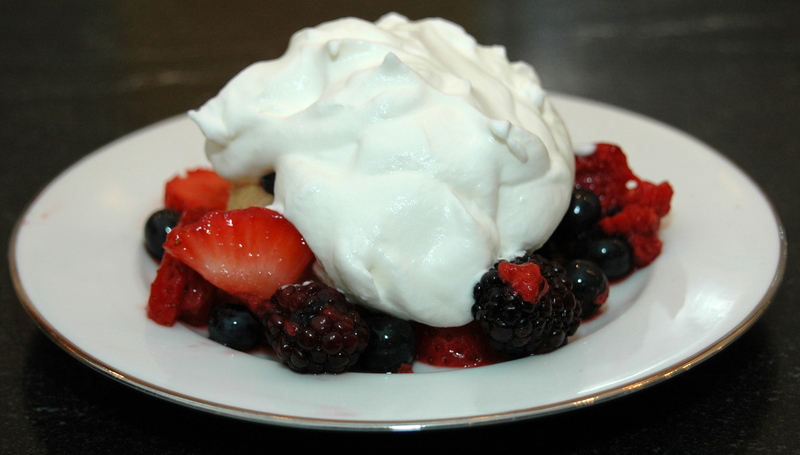 Preparing berries is quick and easy and seemed like a good counterpoint to all of the cooking required for the other dishes. To accompany this autumnal feast we chilled a bottle of sparkling Crémant de Loire from the Loire Valley region of France, and to enrich the berries, a pint of heavy cream. We were so focused on cooking and eating this feast that I only remembered to take a photograph as we were clearing the table. Here it is – No Leftovers! The beauty of this meal is that the vegetables and potatoes can both be cooked at the same, during the last hour that the chicken is roasting. and the prep for these two dishes can be done while the chicken is in the early roasting stage. 2. Trim off the stem ends of sprouts, as well as any yellow leaves. 3. Rinse and dry the sprouts, and cut them in half lengthwise. 4. 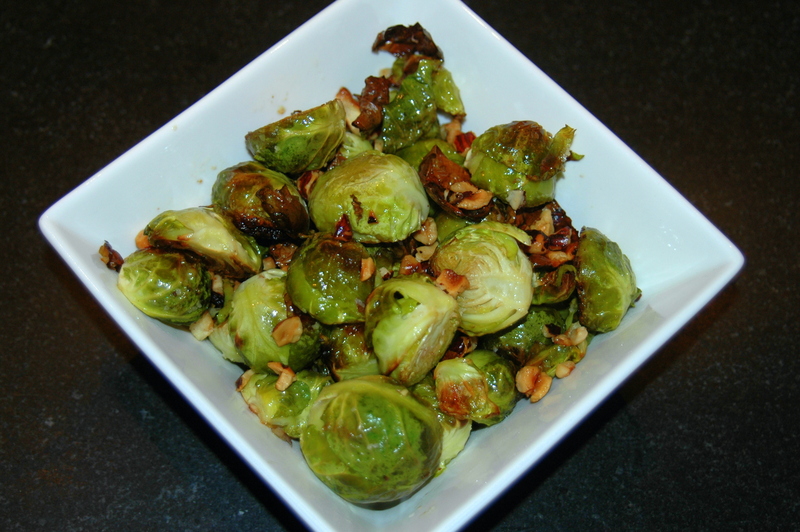 Add cut sprouts to a mixing bowl. 5. Add the other ingredients and toss well. 6. Transfer to a cookie sheet with a raised edge, or a shallow roasting pan. 7. 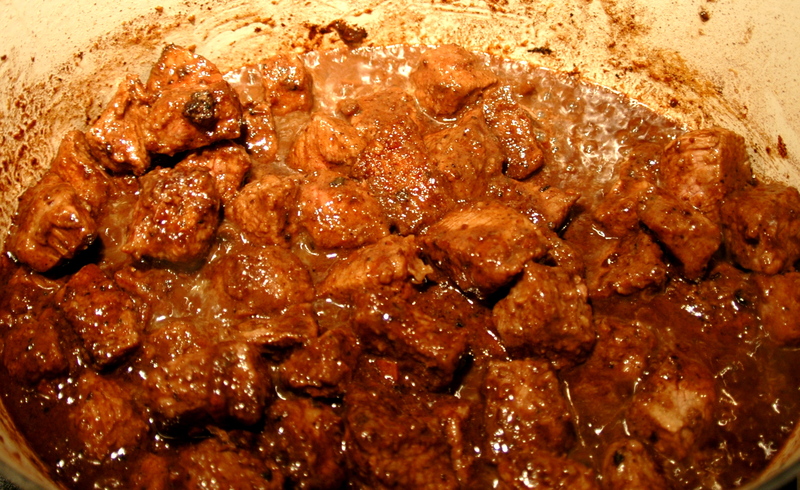 Roast for approximately 25 minutes, turning once or twice to brown on all sides. 1. 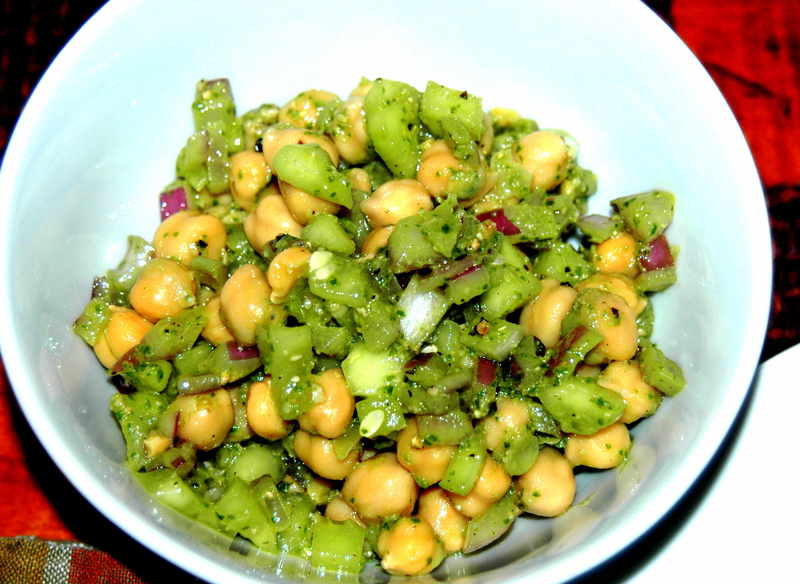 Place the beans, onion and cucumber in a medium sized mixing bowl and stir well. 2. Add the pesto sauce and stir again. 3. Add the lemon juice pepper and mix well. 4. Let sit for several hours to allow the flavors to blend, cover and refrigerate. Please see Grandma Loved Ceci Beans for the background to this recipe. As summer winds down into the first full month of autumn, the last of the basil has been picked. The memory of summer has long since faded as the leaves begin their whirling descent to blanket the lawn with brown, red and gold. While the outside air smells of autumn, the kitchen air is redolent with the vestiges of summer, freshly picked basil. The aroma of basil has always meant summer to me; summer on the Jersey Shore, and summer vacations on Cape Cod, where our first stop was to see Uncle Fred and Aunt Jo. On those latter occasions, not only did Fred provide us with our first night’s dinner, but also with a basil plant that he had carefully tended, and which lasted for the entire month of our vacation. So with October in the wind a few weeks ago, we picked the leaves from the last of our basil plants and decided to extend summer for a few weeks more by making pesto with a recipe from Uncle Fred. 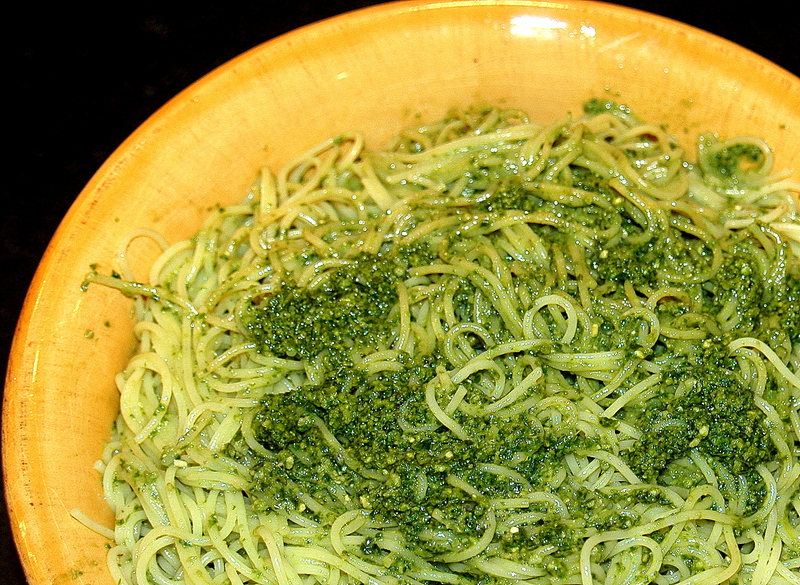 For a brief history of pesto and its ancient method of preparation, before the invention of blenders and food processors, check out the article in this link to the foods of Liguria. Liguria is one of the western-most regions of Italy, it borders on the French Riviera and encompasses Genoa, San Remo, Portofino, and Cinque Terre. Place sun-dried tomatoes with some of their oil in food processor and chop into a paste on ‘Pulse’. Add leftover ratatouille, 1 cup at a time, and continue ‘pulse’ processing until well blended with the sun-dried tomatoes into a paste. Serve as hors d’oeuvre on thin slices of crusty Italian bread, or crackers, or in a cold antipasto combination plate. 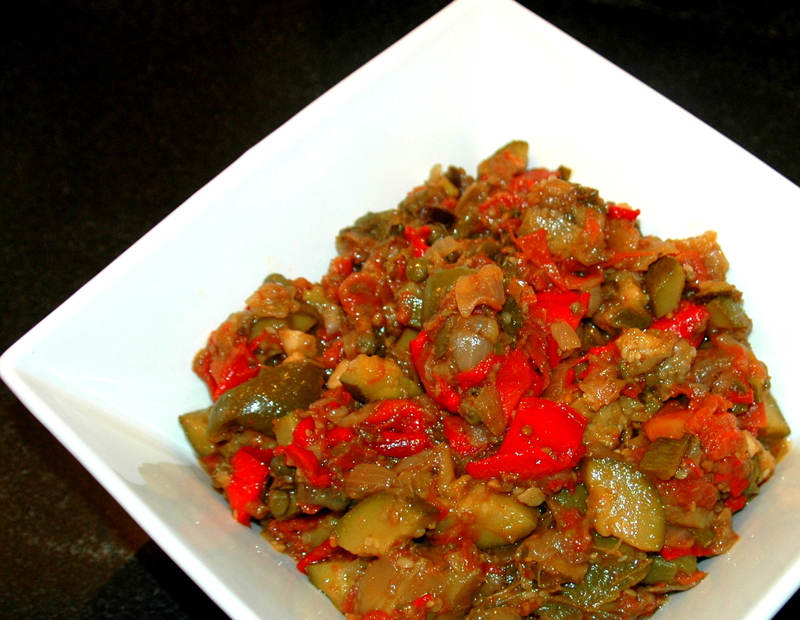 Ratatouille is one of those French dishes that many people have a difficult time pronouncing. However you pronounce it, it is delicious. 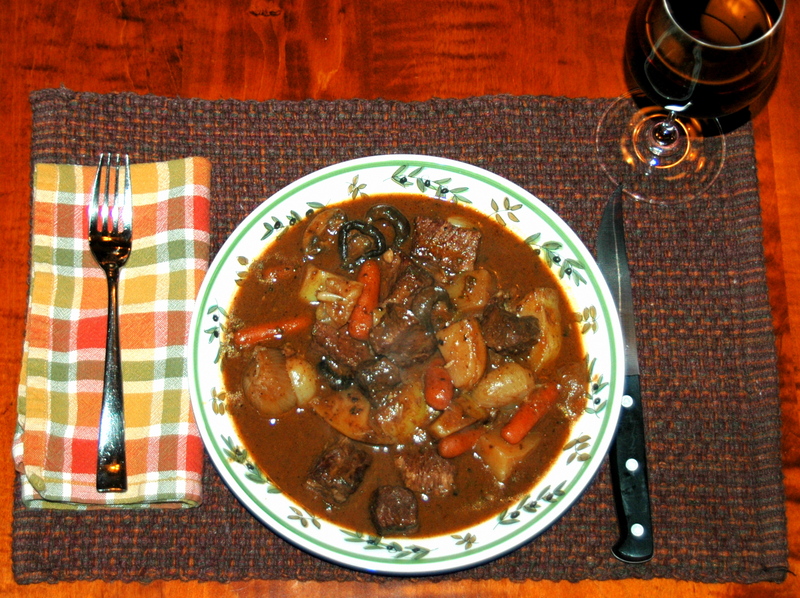 A great vegetable stew that is best served at room temperature as side dish with any meat entree, such as Steak au Poivre or Lamb Chops. 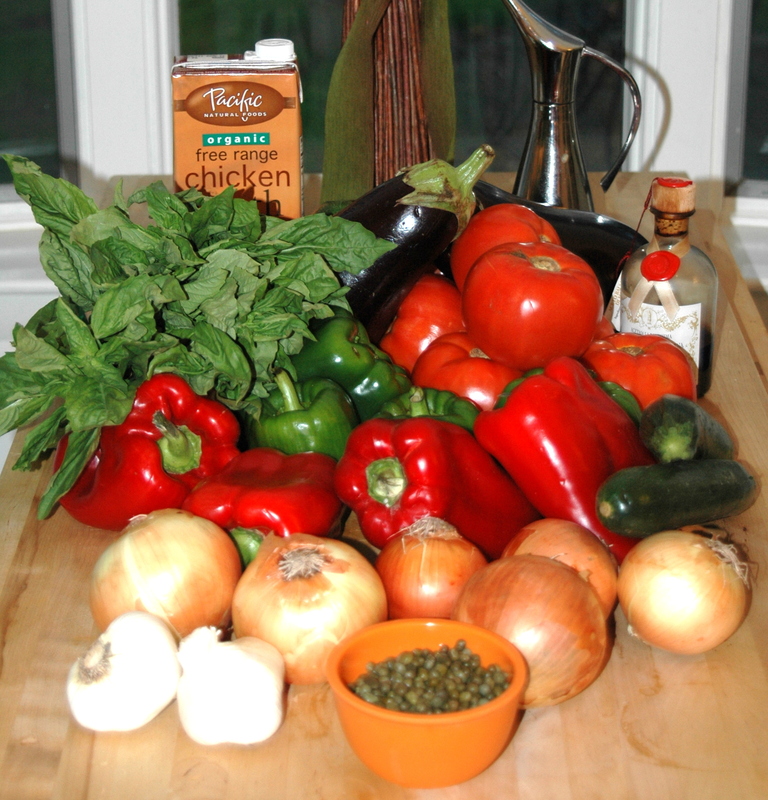 The following recipe will produce about 4 quarts of ratatouille, I usually make a large batch, freeze the leftovers in individual portions in plastic Zip-Lock bags, defrost then in the morning and eat them in the evening; so all of that up-front work is paid back for weeks to come. Or, if you prefer, you can easily cut the recipe in half. 1. Heat 1&1/2 cups of the olive oil in a large sauté pan on medium heat, add the garlic and sauté until soft but not browned. Add the eggplant in batches and sauté until it is cooked to a light brown color. With a slotted spoon, remove the eggplant to a large (12 qt.) stock pot. 2. Add the onions to the pan and scraping up the eggplant and garlic bits–cook the onions until translucent, transfer them to the stock pot, stirring in with the eggplant. 3. Add the remaining 1/2 cup of olive oil to the pan; sauté the zucchini until slightly soft. 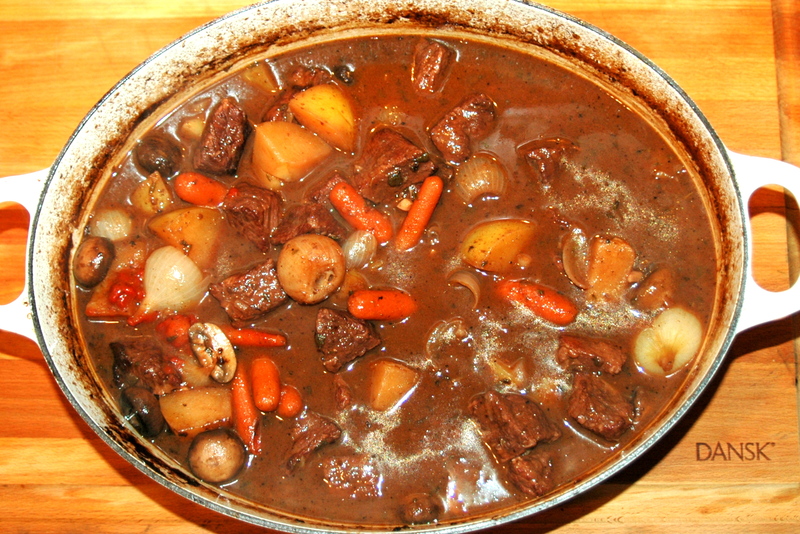 Transfer with a slotted spoon to the stock pot, stirring it with the other vegetables. 4. Add the peppers to the oil in the pan and sauté until soft. 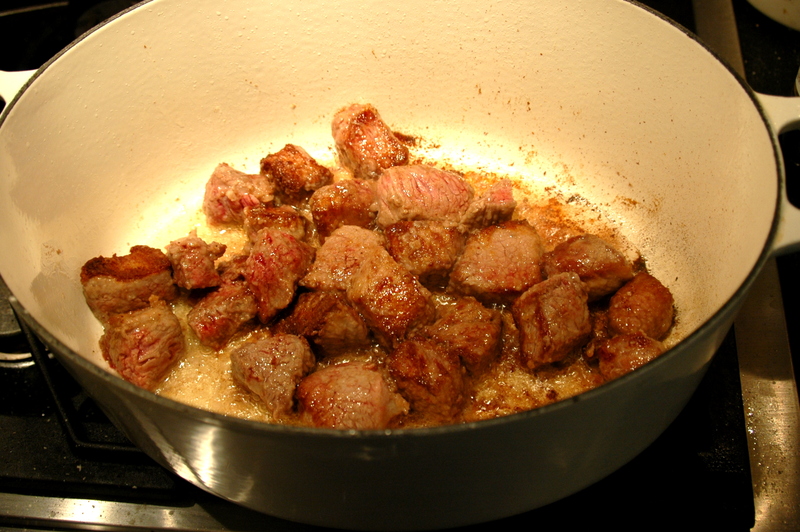 Transfer the peppers and any remaining liquid in the pan to the stock pot. 5. Add the tomatoes and capers to the stock pot. 6. Add the basil, chicken broth and vinegar to the stock pot, mixing all the ingredients well. 7. Cook uncovered on a low flame for 2 hours. 8. When cooked and slightly cooled, drain the vegetables from the liquid and refrigerate the ratatouille. 9. Bring to room temperature for 1 hour prior to serving. Note: Save the excess liquid to use as a base for Garbanzo Bean Soup. Note: When you tire of eating the ratatouille you can use the remainder as the base for a delicious Mediterranean Vegetable Spread. Family, business and charitable work have been occupying our focus for the past two months, but now it is time to get back to cooking, writing and posting. The other night, to kick off the fall season,we decided to cook some fish inside the house, rather than on the grill. With no preconceived idea, other than indoor cooking, I visited our local fishmonger to see what was in that day’s catch. 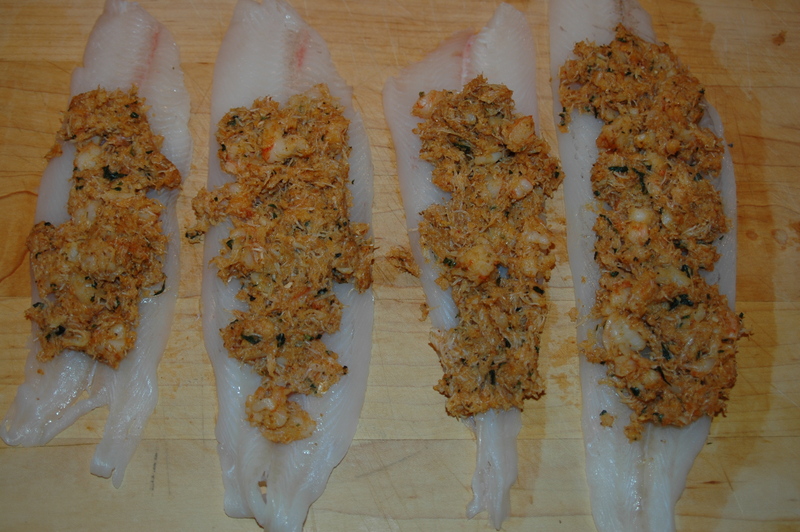 The grey sole was fresh and looked good, so I bought four small fillets, each weighing about 1/4 pound. Now, how to prepare it? 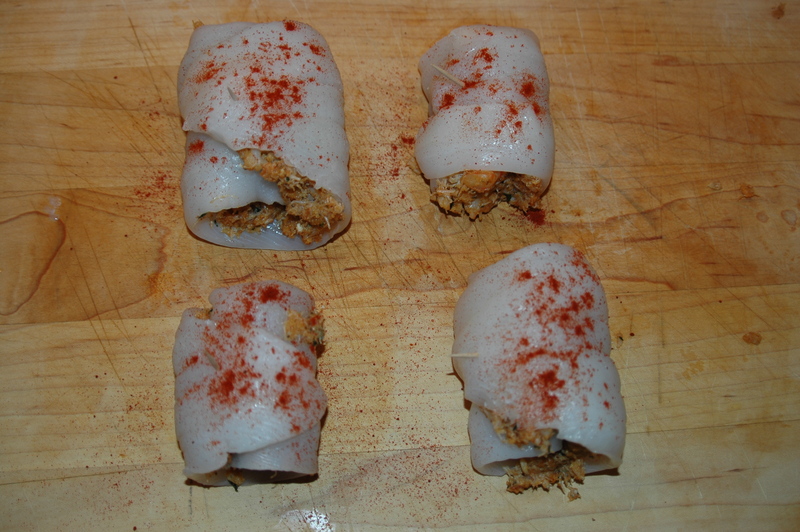 Sole lends itself to many preparations, but I noted some Maine crab-meat in the case and thought that would make a good base for stuffing, and to add a little variety, maybe some shrimp. Since I did not feel like cleaning, deveining and cooking the shrimp myself, I ordered a 1/4 pound of the cooked shrimp. Having made a decision on the fish and the base for the stuffing, the next step was to see what was in the pantry that could finish the dish. I knew that we had breadcrumbs, as well as wine in which to poach the fish, and that the refrigerator held the staples of lemon, butter, parsley and garlic, so after picking up a bunch of asparagus at the fruit and vegetable market I headed home. The parsley in the refrigerator proved to be limp and flavorless, but all of the other ingredients were there. Looking around the garden, I saw that there was still some fresh oregano and thought that could substitute for the parsley. The spice rack revealed hot Hungarian paprika, which not only adds spice but color, and…celery seeds! 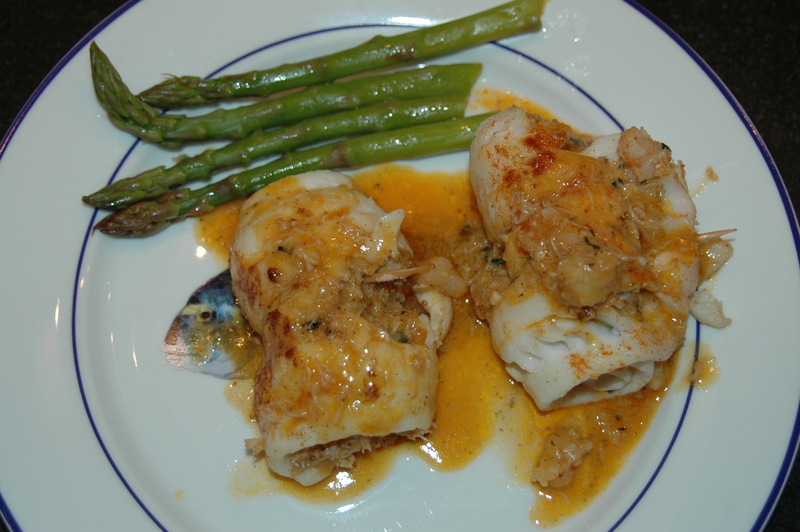 I had never used celery seeds and have no idea why I had bought them in the first place, but I thought that they could nicely round out the stuffing and they did, as you will see after you have tried the quick and easy Fillet of Sole Stuffed with Crabmeat and Shrimp.